The review court for military commission trials issued an en banc opinion yesterday upholding the conviction of Osama bin Laden's driver, Salim Hamdan. In justifying trial by military commission, it reached back to 1818. In that case, U.S. forces under Gen. Andrew Jackson invaded Spanish Florida in 1818 to stop black slaves from fleeing through a porous border. Troops captured two British traders, whom the general ordered face a military commission on charges they aided the enemy by helping the Seminoles and escaped black slaves. The tribunal convicted the men and sentenced them to a whipping. Jackson, a slave owner, declared the punishment too soft and had them executed. The military jury in the trial of Guantanamo Detainee and Osama bin Laden driver Salim Hamdan reached a split verdit: Guilty of terrorism, not guilty of conspiracy. The military commissions trial of Salim Hamdan, driver for Osama bin Laden, went to the jury today. Hamdan never testified in his defense across two weeks of trial testimony. But unlike suspects on U.S. soil... Hamdan had no right to an attorney or right against self-incrimination during 18 months of military and civilian interrogations from Afghanistan to Guantánamo. [T]he Pentagon cast bin Laden's driver as an al Qaeda insider and the defense called him a Sept. 11 scapegoat. "He's an al Qaeda warrior. He has wounded, and the people he has worked with have wounded the world," prosecutor John Murphy told the jury. "You are the conscience of the community." Countered Navy Lt. Cmdr. Brian Mizer, on behalf of the $200-a-month driver: "We will capture or kill Osama bin Laden some day. You should not punish the general's driver today with the crimes of the general." By the numbers: There were only 10 media members in attendance on the last day of testimony. It took a Pentagon airlift to get most of them there at all. The defense has rested in the Guantanamo military commission trial of former driver Osama bin Laden driver Salim Hamdan. The testimony for the defense portion of the case was closed to the public and journalists -- not because Hamdan or his lawyers wanted it closed but because the rules mandated it. The military commission trial of Osama bin Laden's driver, Salim Hamdan, got underway today. 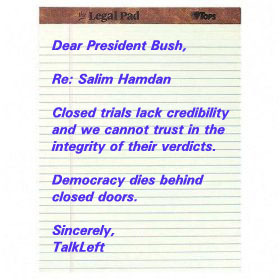 The Judge barred the prosecution from introducing statements Hamdan made while detained at Bagram AFB in Afghanistan because they were the product of overly coercive techniques. The judge said the prosecution cannot use a series of interrogations at the Bagram air base and Panshir, Afghanistan, because of the "highly coercive environments and conditions under which they were made." At Bagram, the judge found Hamdan was kept in isolation 24 hours a day with his hands and feet restrained, and armed soldiers prompted him to talk by kneeing him in the back. His captors at Panshir repeatedly tied him up, put a bag over his head and knocked him the ground. Jury selection in the military commission trial of Guantanamo detainee Salim Hamdan is set to begin Monday morning. In a nutshell: The Government has charged Hamdan, a driver for Osama bin Laden, mostly with acts that predated 9/11 by years. The defense says his conduct did not occur "in the context of" an armed conflict, or was not "associated with" an armed conflict. [A]t least five military officers will make up the jury, and a two-thirds vote is required for a guilty verdict. A three-fourths votes is required for sentences that are longer than 10 years. "Hamdan's trial, like those of other Guantánamo detainees accused of war crimes, should take place in an ordinary federal court or in a traditional military court. 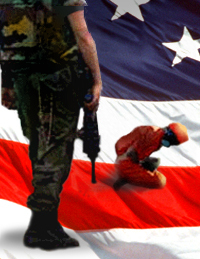 The Guantánamo military commissions allow the government to rely on evidence that the defendant never sees, on hearsay, and on evidence obtained through torture. The commissions are completely inconsistent with the Constitution and should be shut down." A U.S. District Court judge today denied a continuance request for Salim Hamdan, former driver to Osama bin Laden.